Thanking You so much for beautiful designs!!! This is so darling! Love it! Thanks. DH tells me I've never met a teddy bear I don't love, and this one is just wwnderful. Thank you so much for sharing it! Adorable design! Thanks so much. A little bear you feel you can cuddle. Thanks a lot. Love the teddy bear! Thank-you so much. Cute and very sweet. Thank you so much! She's such a cute bear! Thank you. Thank You for the sweet baby bear. Thank you. Darling little bear. What a sweet little bear, thanks. Thank you ... so very cute. So sweet bear, thank you! Very cute Teddy Bear, thank you. Cute bear... I love it. Thank you for a wonderful bear. Thanks for another cute bear. Thank you for the cute little bear. Thank you what a sweet little bear. Thank you so much for the lovely designs...What a difference the colour change makes to the G.
So adorable, this will be put to good use. We have alot of babies this year. Thank you. I love this smiley bear, thank you. So beary cute. Thank you. sweet little bear, thank you! Thanks, she is so sweet. Thank You for giving us all these wonderful designs to embroider...now if we just had time to do them all that would be GREAT. I donot have time enough for all I want to embroider. Love it, soooo cute!! Thanks. Carol I forgot to tell you , that you have to click on the picture and it will bring up another page so you can download the design from this, hope this helps. Thanks for the tips. I have done other designs that were wonderful. By using white thread for the bow, it will look like an angel to. Very cute.Thank you. Thank you for the cute teddy. sewinggranny, I have found that usually when my outlines don't match up, I can either double up on stabilizer or use a heavier weight and it works.. 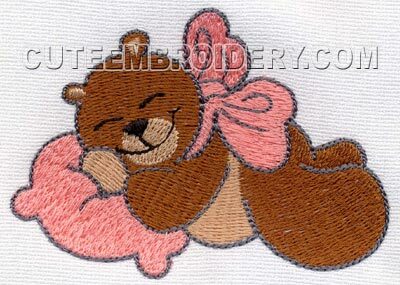 I have sewn numerous designs from this site and not had a problem yet. This is just 2 cute!!!! Many thanks!!! Isn't she just too cute! My grandbaby is a boy, so I'm going to use blue thread instead of pink.